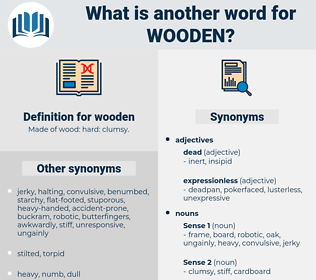 What is another word for wooden? 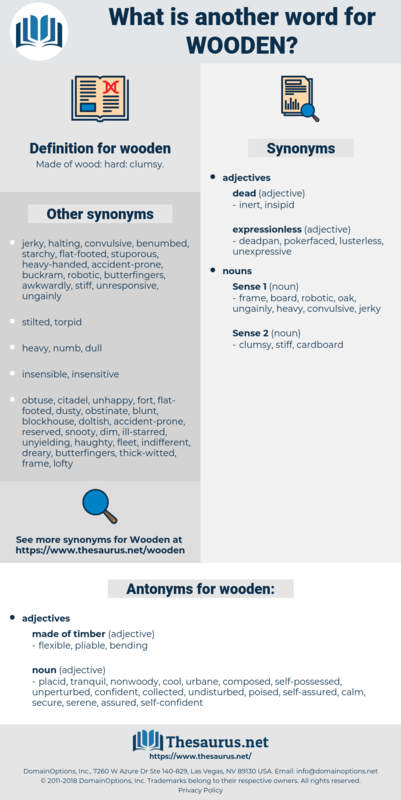 Made of wood: hard: clumsy. placid, tranquil, nonwoody, cool, urbane, composed, self-possessed, unperturbed, confident, collected, undisturbed, poised, self-assured, calm, secure, serene, assured, self-confident. They passed through the wooden gate. Mrs. Bosher's heavy steps went down the wooden stairs; the door of the house was opened, shut, and locked, and Juliet's spirits rose when she knew that she was alone.